Visiting local food markets in any city you visit is the best way to get to know not only the local products of a region but also their inhabitants and their customs. That’s why when traveling I always like to spend some time visiting these places. Okay, eating through them! Budapest markets are great places to do your shopping, due to the favorable climate. Hungary produces tasty fruits and vegetables that can be bought in the markets at a reasonable price. Whichever season you go there they have some great seasonal products. 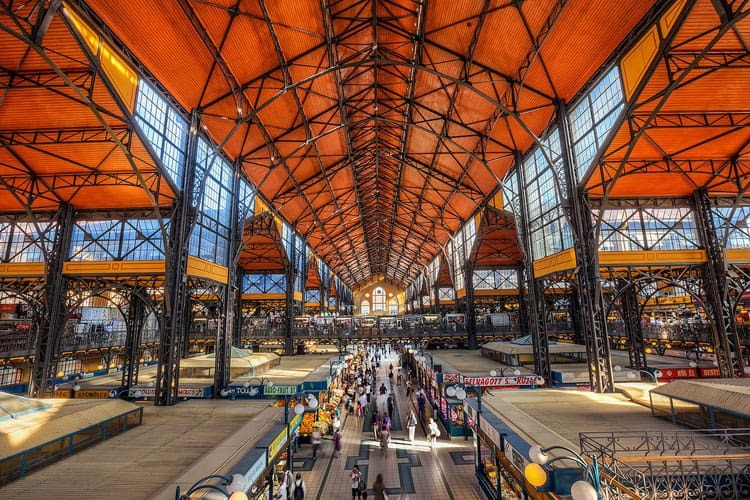 The most impressive and largest market in Budapest is the Great Market Hall, at the Pest end of Liberty Bridge, which looks as if it’s worth a visit just to admire its architecture. On the three levels of the more than 100-year old building, you can get almost everything. Most of the stalls on the ground floor offer meats, pastries, candies, spices, and spirits such as paprika, tokaji, túró rudi, and caviar (Never tried any of those apart from paprika, so it looks really interesting!). The basement contains a supermarket, fish market, and pickles and the second floor has mainly eateries and souvenirs. They recommend trying the langosz, a type of bread that you can order with a variety of sweet or savory toppings. 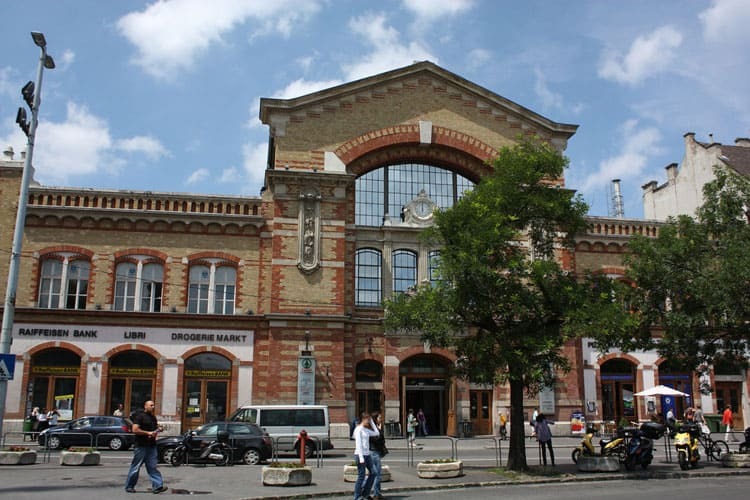 If you have limited time for shopping, the Great Market Hall is a great option. This is a spacious two-story food market in Southern Buda. On the ground floor they sell all sorts of products and on the first floor, they have butchers, greengrocers and pickle makers along with traditional homemade mangalica or ordinary pork sausage, salami, bacon, smoked meat and dairy products from small producers. On the second floor, you can also have a break in one of the eateries, buffets cafes or pubs. Address: Kőrösi József út 7-9., next to the Allee Shopping Center. Opening hours: Monday: 6.30-17.00, Tue-Fri: 6.30-18.00, Sat: 6.30-14.00. This a charming market hall facing the imposing Parliament on the other side of the Danube. Here you’ll find fruit and vegetable vendors and on the top floor, there are nice cafes from where you can admire the superb view of the Danube and the Parliament. And contrary to the other markets, this opens on Sunday! Address: Batthyány tér 5., I. district, M2 metro Batthyány tér station. In the following bio markets you’ll find some certified producers selling their products: fruits, vegetables, jams, honey… No doubt the prices are higher than in ordinary markets but it can be worth it if you really appreciate the quality. Biomarket in the court of MOM Park located at Alkotás út 53. XII. district. Open: Saturday only: 7.00-12.30. Albertfalvai Biomarket located at Fehérvári út 213., XI. District Open: Wed 7.00-17.00 Sat 7.00-13.00. How about you? 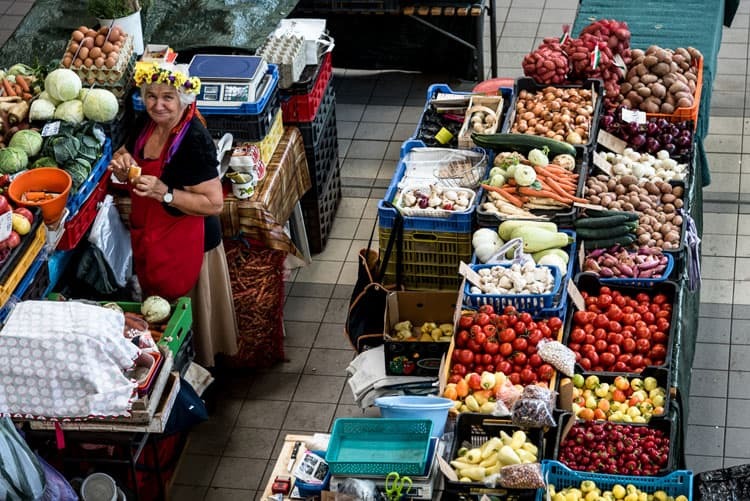 Have you ever been to any of these markets in Budapest? As great as the farmer’s markets around where I live are, I’ve always want to live (or at least visit) in a place that has large markets like this. There’s just something really beautiful about them, I think, and that’s not just my stomach talking!